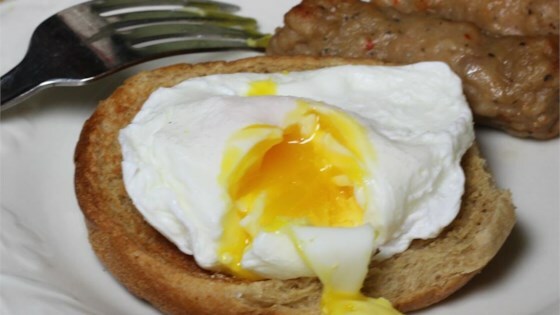 "Here's a new and improved version of our poached egg method. Nothing too complicated here; we pretty much poach eggs like everybody else, except we've got a little step in the middle that makes it easier if you're doing this for a larger group." Fill a bowl with ice water. Fill a saucepan with cold water and place over medium heat; stir in vinegar and salt. Bring to a gentle, slow simmer and reduce heat to low. Break each egg into a separate small ramekin; place a ramekin close to the surface of the water and gently pour egg into the simmering water. Let egg white set for a minute or two and use a silicone spatula to gently lift egg from the bottom of the pan to prevent sticking. Cook until white is firm and yolk is runny, about 6 minutes. Lift poached egg from water using a slotted spoon and transfer gently to bowl of ice water to stop the cooking process. Reheat eggs for 1 1/2 to 2 minutes in very gently simmering water and remove with a slotted spoon. Tap bottom of slotted spoon containing egg on a dry paper towel to remove any excess water before serving. See how to make a classic brunch dish with poached eggs and hollandaise. Poached eggs in ice water can be refrigerated overnight if desired; just reheat before serving. To reheat poached eggs, bring a pan of water to a bare simmer and slide eggs into simmering water until warmed through, 1 1/2 to 2 minutes. Remove with a slotted spoon; tap bottom of spoon on a dry towel before serving. Try these with the Smoked Salmon Dill Eggs Benedict recipe. This was my first time making poached eggs, so I followed the recipe and 6 minutes is way too long. The eggs were not runny at all. I was very disappointed. 6 minutes was too long. Next time I'll try 4 minutes. Perfect!! Once again, Chef John delivers! 6 minutes is too long when cooking with a gas range. I tried again reducing the time to 4 minutes and they turned out much better.